1. Using a hand mixer, in a large bowl, mix together cake mix, eggs, yogurt, corn oil, applesauce, cinnamon and water. Beat until just blended. 2. Pour cake batter into a greased 9x12 pan. Bake at 350˚ for 18-22 minutes or until a toothpick poked through the center comes out clean. 3. While cake is baking, get a new bowl or clean the batter bowl, and mix together flour, sugar, brown sugar, cinnamon and cubed butter using an electric mixer. Beat on a high speed until big crumbles form. About 2-3 minutes of mixing. 5. Prepare the icing by beating powdered sugar, vanilla extract and milk together in a bowl. 6. To pipe the icing onto the cake, fill a plastic sandwich bag with icing and cut a small hole in the corner. Squeeze the bag of icing over the cake in a zig zag fashion. 7. Cut cake into 12 squares and serve warm or make ahead the night before and seal with plastic wrap once cooled until morning. Imagine this: It’s Saturday morning and you have nowhere to go. You’re wearing your favorite pair of fuzzy socks. There’s a cup of freshly brewed coffee sitting on the table and next to it is a big slice of fresh-baked coffee cake. You with me? Now, let’s take it one step further and imagine that this coffee cake has the most perfect crumble topping… AND it’s lightened up. So the size of your slice (remember, it’s BIG) is totally justifiable. Sound too good to be true? It’s not! It’s entirely possible with a few strategic ingredient swaps. Wanna know what they are? I really love using oil when baking because it’s one of the secrets to a very moist and delicious cake. So choosing an oil with some added benefits is an easy swap. 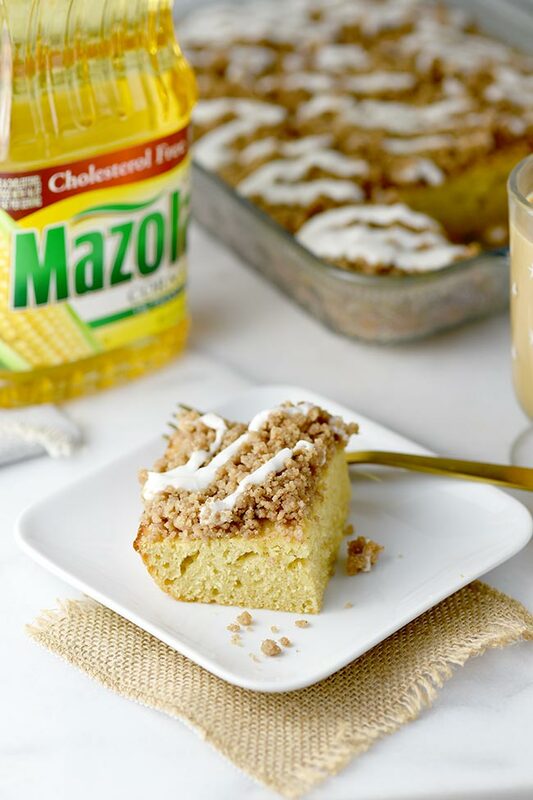 I swapped my regular cooking oil for Mazola® Corn Oil which is cholesterol free and clinically shown to reduce cholesterol 2x more than extra virgin olive oil. To learn more about cooking with corn oil, go to MAZOLA.com. 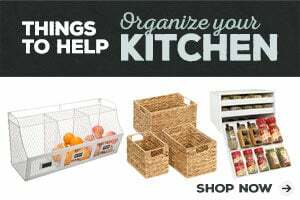 Since I use oil for baking as well as cooking, I typically buy the bulk size. 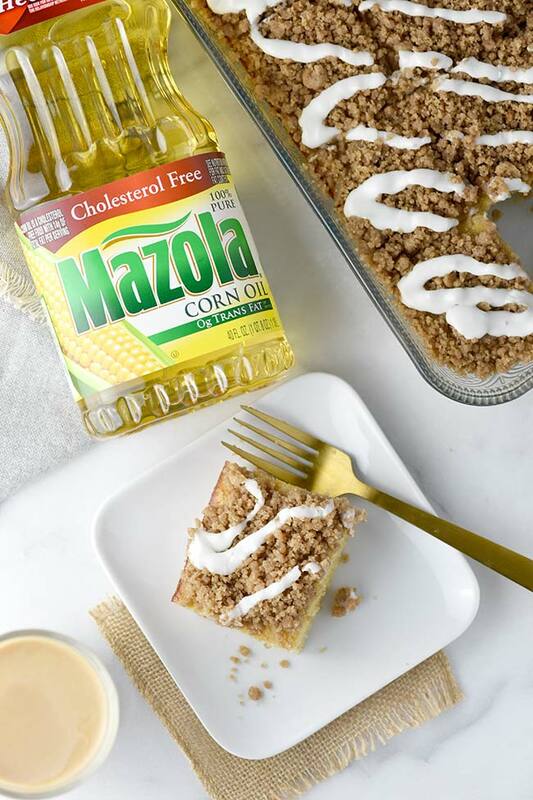 I choose Mazola Corn Oil specifically because it’s heart healthy and is an all-purpose cooking oil, good for anything from baking, grilling, sautéing, stir frying, to mixing up a marinade or dressing. Corn oil has a neutral taste so it doesn’t interfere with the natural flavor of the other ingredients. When you think corn oil you might not think heart-healthy but it is! Corn oil has more cholesterol-blocking plant sterols than other cooking oils. Are you surprised? I was before I learned more about different types of cooking oils. One other little fact that’s pretty neat is that corn oil has a smoke point higher than most cooking oils at 450°F so it’s great for high-heat cooking like grilling or sautéing. 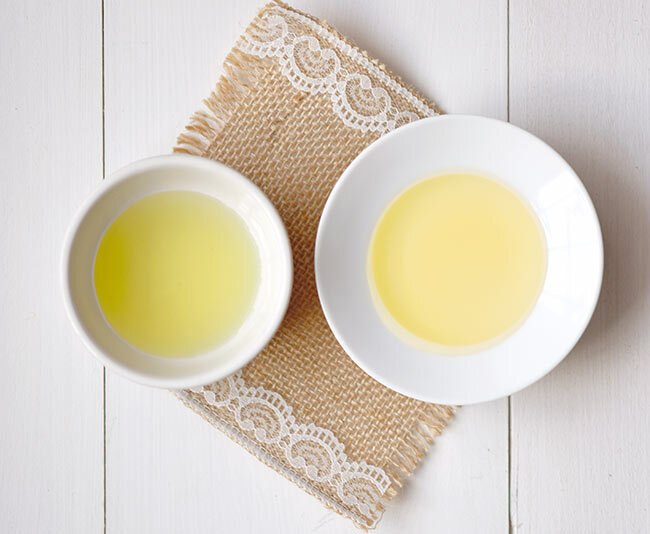 All cooking oils have a smoke point that, once exceeded, can negatively affect your food’s flavor and nutritional value so the higher the smoke point, the more versatile the oil. 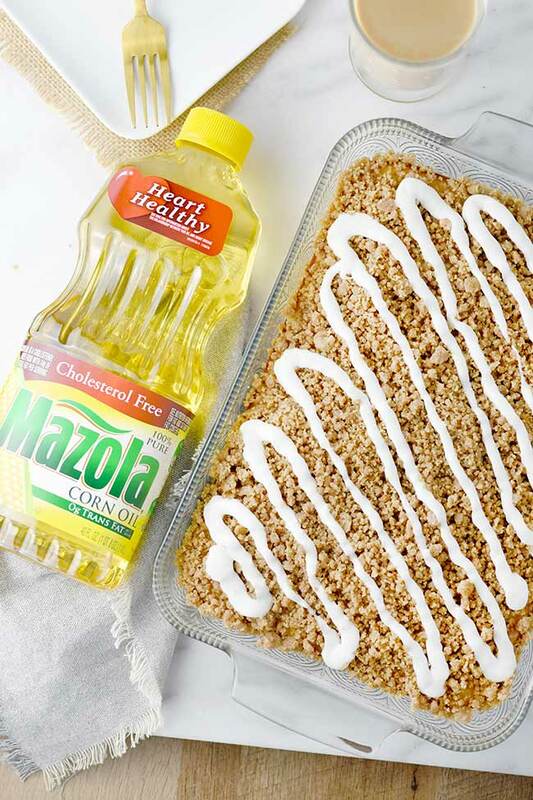 Swap #1 – Choose heart-healthy​ Mazola Corn Oil instead of canola oil. So that’s the first swap. Ready for more? Swap #2 – Substitute 1 or more eggs with nonfat Greek yogurt. 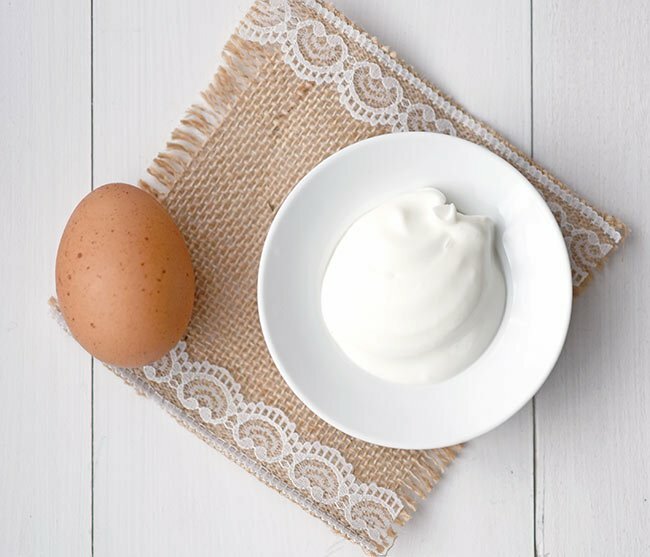 Greek yogurt contains protein, calcium and potassium, is a lot lower in cholesterol than an egg, and is fat free assuming you buy the 0% fat yogurt. At a 1/4 cup yogurt to 1 egg substitution ratio, you can successfully swap out as many eggs as you want. If you or someone you know has an egg allergy, then try this swap! I personally like the flavor and texture the yogurt adds but we don’t have any egg allergies so I like to just swap out one of the eggs for the health benefits and keep the other two for the fluffy qualities the egg provides. If you swap all your eggs for yogurt, you can expect a more dense yet very moist cake. Ready for the last swap? 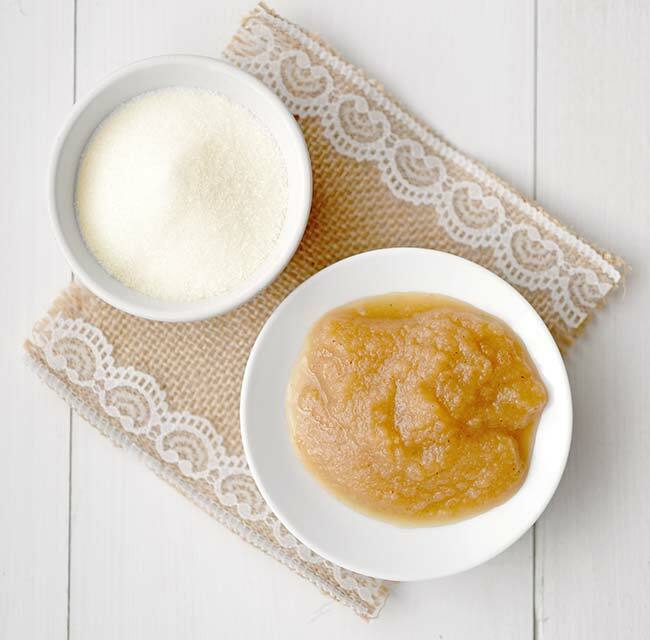 Swap #3 – Substitute pudding mix with applesauce. 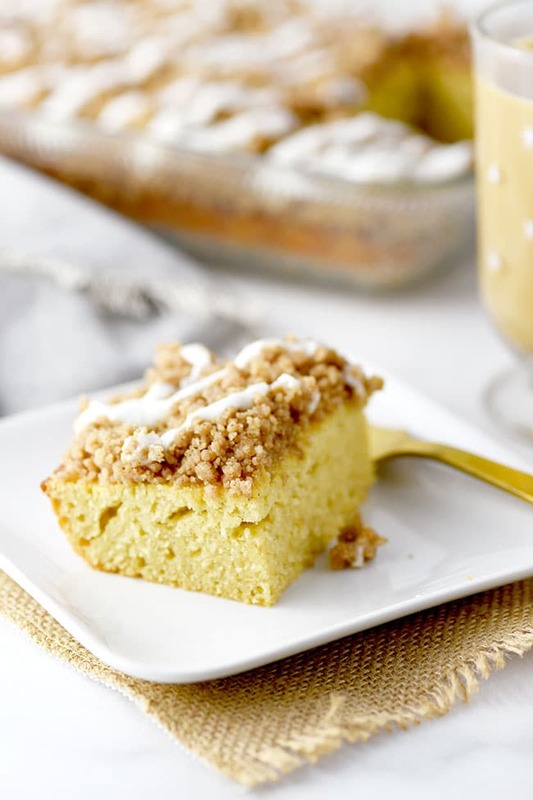 One of the typical ingredients you’ll find in homemade coffee cake is a pack of pudding mix. It adds an extra layer of flavor however, if you want a healthier choice that adds flavor as well as vitamins and fiber, then applesauce is a great swap. It enhances the overall flavor of the cake, compliments the cinnamon, all while adding moisture. 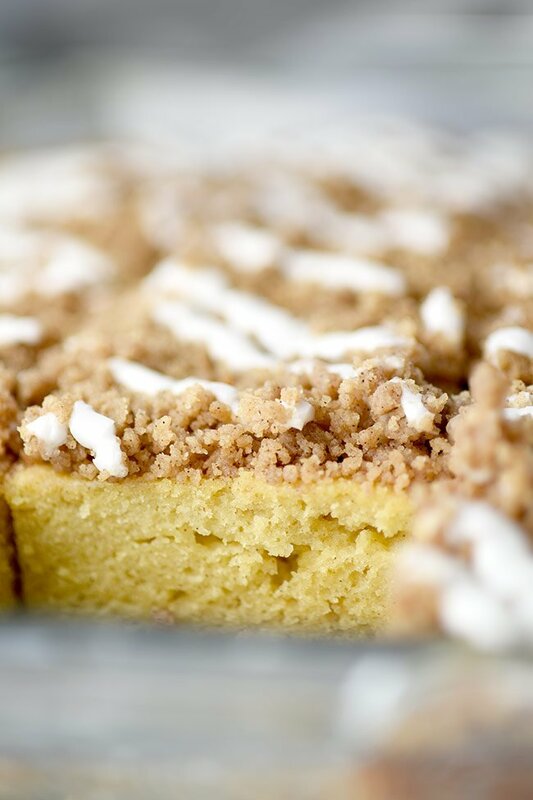 So those are some of my favorite easy swaps for lightening up your coffee cake. You can use these swaps in other cooking as well. Now, let’s talk about the crumble. My favorite part! I’m guessing maybe yours too?? There’s a trick I have to getting perfect crumble. I’ve tried a number of coffee cake recipes and I’ve learned that when you cook your crumble with the cake, the sugar crystallizes and forms a crunchy layer between the cake and the crumble. I’m not a fan of the crispiness when everything else is light and fluffy and soft. So, this cooking method takes a little bit extra effort and careful timing but I think it’s worth it. If you’re in a hurry and you don’t mind the crunchiness, go ahead and cook your crumble on top of your cake. If you want crumble perfection though, follow the steps in the recipe and I think you’ll find this different cooking method makes the cake a whole lot more delicious. 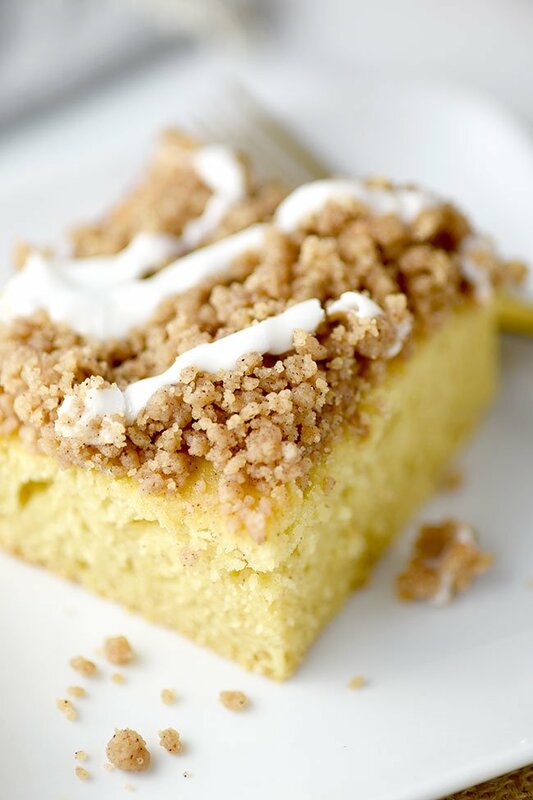 This lightened up coffee cake recipe was featured on Full Plate Thursday, Raising Homemakers and South Your Mouth!